A Fox Chapel Middle School teacher was fired after giving students an assignment district officials felt was not appropriate. 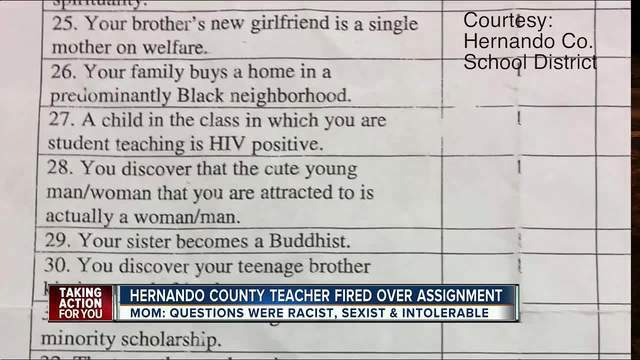 The Hernando County School District did not identify the teacher. In a statement they said in part, "in no way, does that assignment meet the standards of appropriate instructional material". The supplemental assignment that was given to students instructed them to circle a response for a series of questions, which asked them about their comfort level. "How comfy are you if you see a group of black men walking to you on the street? That's completely inappropriate. In no world, whatsoever, is that okay to question a child on," Jennifer Block said. Jennifer Block's 12-year-old daughter was given the assignment. "I thought it was very inappropriate. I thought some of them were racist. I thought some of them were sexist. I thought it was completely intolerable," Tori Drews said. Drews is in 6th grade. She received the assignment during her 7th period Leader In Me class. She said they were learning about accepting people's differences. "There were children that were saying this is wrong. Why are we doing this? Does this have a reason? She was going yeah this is kind of wrong...maybe I should take it back," Drews said. Drews said the teacher, who was let go, handed out the assignment to the class. "Kids were asking if they could share it with their parents. She was like no. Don't show your mom. Don't take that home. I'm taking it back up," Drews said. District officials said the teacher joined the middle school in January. Officials said she was still under her probationary period when they fired her. "I believe that it was very wrong what she did. That she didn't ask anybody before she gave it out, but I think that maybe she should have been put on a break and had like another training on something like that," Drews said. Drews mom agrees with the punishment. "I think that it was probably best," Jennifer Block said. ABC Action News reached out to the teacher and we are waiting for a response.